Pernamatic EPH3 CNC corner and transom cleaner. Prices for a top of the range model like this, when brand new, would be around £33,500. 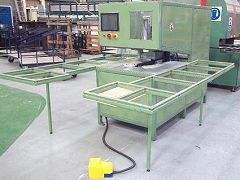 Obtain a used 2008 top of the range machine at a fraction of the new price. This is a one-off, with: bevel/sculptured finishes, touch screen/on board teaching, profile recognition, infrared location and full service history. Price includes programming to suit your profile and installation (mainland UK).